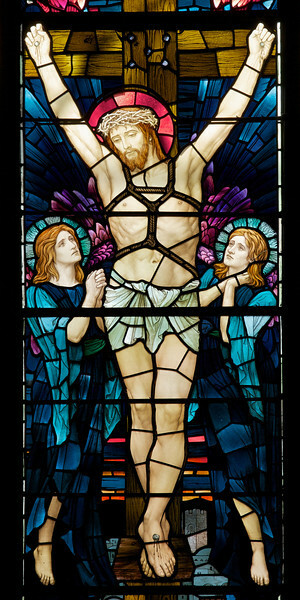 "In the main panel Jesus is seen fixed to the cross with the two thieves who were crucified with him on either side. On the left side Mary Magdalene, Mary, the mother of Jesus and Solome, the mother of James and John." There are 17 stained glass windows created by Henry Holiday of London, all memorials to various members of the Rhinelander family. Holiday made all 17 except for the west window, which was completed by his daughter after his death. The windows are the only complete cycle of windows remaining by Holiday, and the church is one of a few churches in the world in which all windows are designed by one artist, according to church website. Holiday's stained glass work can be found all over Britain and some of his best is at Westminster Abbey according to Wikipedia.